1. First perform the Peeling Regenerating (cover eyes with an eye compress before application). Apply the product to face, neck and décolleté, avoiding eyes and lips. Leave on for a maximum of 4 to 5 minutes, then rinse thoroughly with water. 2. 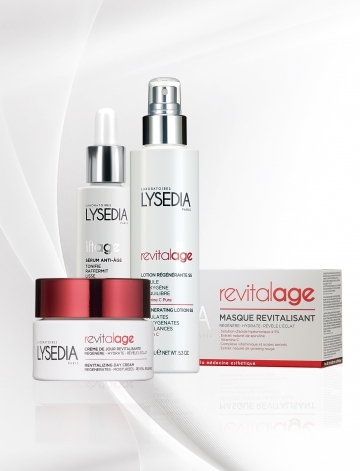 Apply the Revitalizing mask, taking care to comply with the instructions printed on the back of the packaging. 4. Nettoyer et stimuler la peau avec la lotion vitaminée rééquilibrante Lotion Régénérante S5. 5. Gently pat skin dry. 6. Apply Acti-Serum as a base and gently massage into skin. Apply Revitaderm revitalizing and moisturizing cream. For an intense initial treatment, use 1 mask every 10 days for 1 month. As a radiance booster, for an immediate effect, perform a Revitamax treatment.